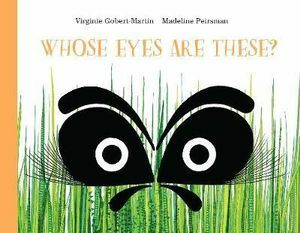 A pair of animal eyes is pictured on one page, while the opposing page asks, “Whose eyes are these?” As the eyes are removed from most of the context of face and body and rendered in near geometric shapes, so that they appear almost as an abstract pattern rather than naturalistic, this is an impossible question to answer. Turn over the page, and the animal is identified and characterised in a few short lines of poetic and somewhat whimsical prose on one page and depicted on the other in the same style as the eyes had been. Turn over again, and the reader is challenged to find the animal hidden in a version of its natural habitat in which the colours, shapes and style established in the earlier illustrations are pushed even closer to abstraction. There is a lemur, a jellyfish, a hedgehog, a hummingbird, a stag, a fox, an owl, a praying mantis and, finally, a shrimp. The animals are recognisable, if stylised, and there is a glossary at the back with a short paragraph which gives natural history facts for each of them. But the joy of this big format book is in the exuberant and imaginative design and colour, its revelation of pattern in nature, and its frequently humorous pictorial characterisation of the animals and their habitats.